The bull have been strong up till now. 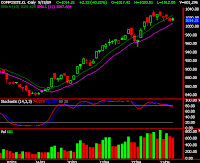 There no sign of weakening except that Daily Stochastic and Weekly Stochastic (refer to KLSE Daily and Weekly chart). And also index hold well above the moving average (the high and the low). 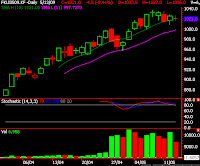 I will base on the KLSE composite index as reference for my future shorting action. If index breaks below the recent daily low of 1013 registered on 12 May 2009, there is high chance that the trend will turn down. I will short future index. A piece of FKLI chart is attached for reference. Of course, this action of shorting has to be temporary as the overall trend is still up. A close stop loss should be used.